FAST 87MM Throttle Body No Sensors 03-up 5.7L, 6.1L,6.4L Hemi FAST 87MM Throttle Body 05-12 Chrysler 300 Hemi, FAST 87MM Throttle Body 05-12 Jeep Grand Cherokee Hemi, FAST 87MM Throttle Body 06-12 Dodge Charger Hemi, FAST 87MM Throttle Body 03-12 Dodge Ram Hemi, FAST 87MM Throttle Body 04-12 Dodge Durango Hemi, FAST [FAST 54088 87MM LT Throttle Body] - $369.95 : 3rd Strike Performance, Your Source for Late Model MOPAR Performance Parts and Accessories! 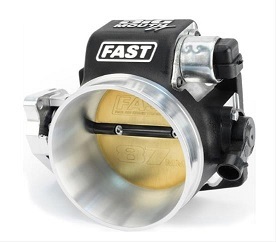 FAST Big Mouth LT throttle bodies are cost-effective and stylish. If you don't want to go billet or can't afford it, these throttle bodies are the perfect choice for a variety of applications. An enlarged bore allows for increased airflow to support your higher horsepower, a progressive throttle pulley enhances drivability--especially at low throttle--and a double return spring provides a solid feel and increased safety. Here's an excellent alternative with all of the same features as their billet bodies--FAST Big Mouth LT throttle bodies with black wrinkle powdercoating.